Specification: Color: Silver Material: high quality T316 stainless steel Length: approx. 100mm Thread diameter: approx. 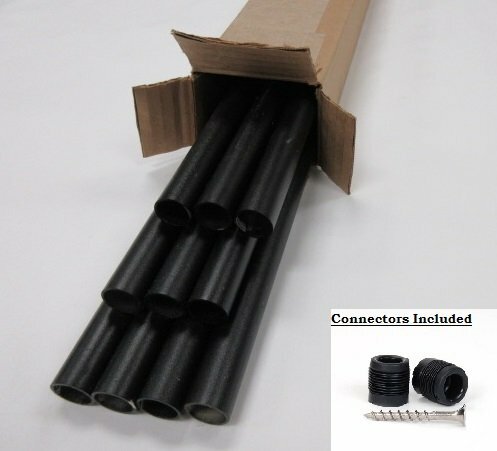 1/4" Fit for cable: 1/8" Quantity: 50pcs Hole diameter: approx. 3mm High strength and hardness. Used for cable railing systems. Package included: 50 x Threaded Terminal, Washer, Hex Nut and Cap Nut. Designed for use with 1/8" (3.2mm) 1/19 strand stainless cable. Comes with 316L nut, washer, and finish acorn nut. Hand swage, require hand crimp Swage tool. Stainless is suitable for outdoor or indoor and has an excellent shine and radiance to it. Can be installed at any angle,perfect for cable railing along stairs or odd-shaped perimeters. Deckorators Baroque Aluminum Balusters provide the beautiful appearance of hand-forged wrought iron, at a fraction of the cost. 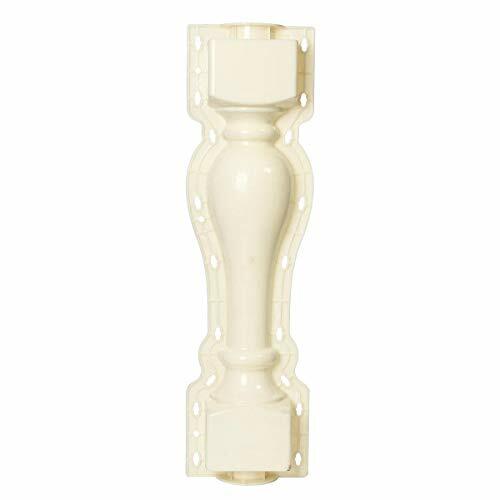 Baroque balusters lend your outdoor project European flavor. They are designed to install 2.5 balusters per linear foot using our installation guide. Available in packs of 5; or contractor packs of 60. Aluminum balusters are powder-coated with AAMA2604-compliant material, which provides five times the outdoor exposure and twice the humidity exposure as AAMA2603. These Round Aluminum Balusters provide a clean, contemporary look to your railing. Low maintenance and easy to install, the aluminum balusters can be paired with vinyl, aluminum or wood. Easily construct your own stair railing with the included baluster connectors. The connectors eliminate the need to rout holes while providing a finished look to your railing. The balusters are aluminum with a textured black powder coating that is commercial grade and will last throughout the years. 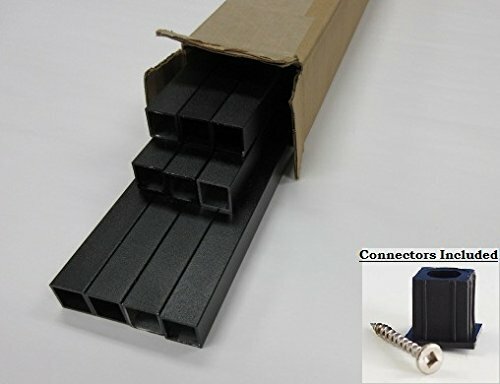 10 pack of balusters with a 20 pack of stair connectors, screws included. BW Creative Rail Simple 26" Brown Powder Coated Round Metal Baluster - 10 pack. A straight metal baluster offering clean, contemporary lines. Round powder-coated metal balusters are low maintenance, rust resistant, ACQ treating compatible. These aluminum balusters can be installed on any wood or composite deck. 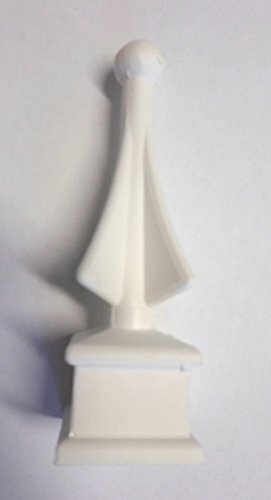 Deckorators Traditional face mount balusters. 1/2" x 1" x 40". Rectangular aluminum baluster with powder coat finish. 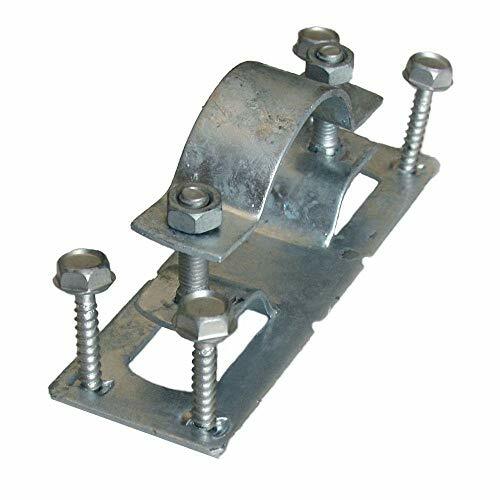 For use in custom wood deck railing or with face mount installation. Sold in packs of 10. Each baluster is 1 wide, 1/2 thick and 40 in length. Matching stainless steel screws are included. Used for cable railing systems. 1.Perfect for installation on exterior decks, marine rigging, or interior applications. 2. For anchoring 1 cable run into metal, wood, plastic or composite posts. 10 x Turnbuckle Hand Swage Tensioner. Designed for use with 1/8 (3.2mm) 1/19 strand stainless cable. 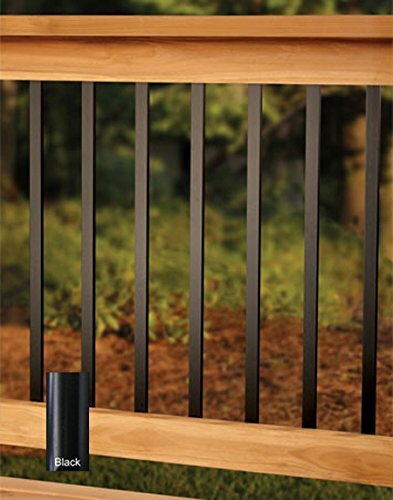 These Square Aluminum Balusters provide a clean, contemporary look to your railing. Low maintenance and easy to install, the aluminum balusters can be paired with vinyl, aluminum or wood. 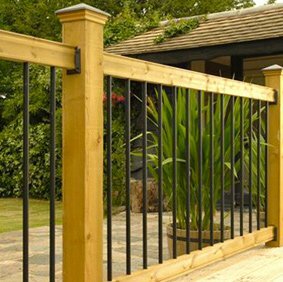 Easily construct your own straight railing with the included baluster connectors. The connectors eliminate the need to rout holes while providing a finished look to your railing. The balusters are aluminum with a textured black powder coating that is commercial grade and will last throughout the years. 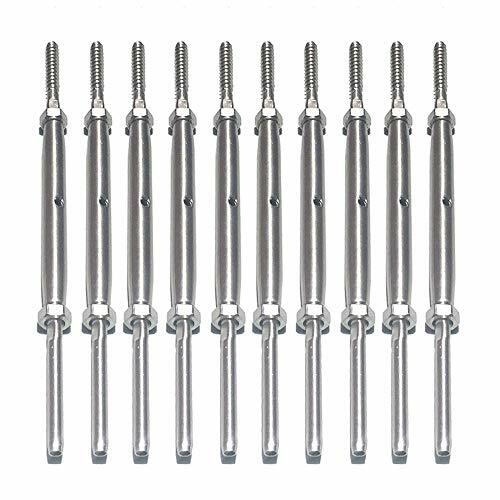 10 pack of balusters with a 20 pack of straight connectors, screws included. 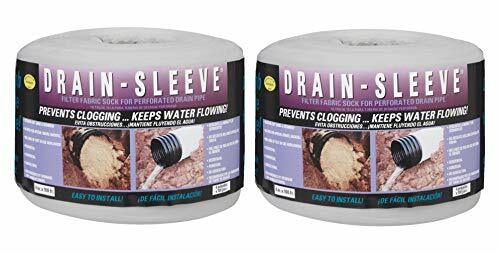 2 Pack, CARRIFF CORP 04100-10 Fabric Sock, 4" X100', Filters out sand and sediment. No need for special gravel backfill, for residential, commercial, or agricultural. Do not use where water pressure is needed. These Round Aluminum Balusters provide a clean, contemporary look to your railing. Low maintenance and easy to install, the aluminum balusters can be paired with vinyl, aluminum or wood. Easily construct your own straight railing with the included baluster connectors. The connectors eliminate the need to rout holes while providing a finished look to your railing. 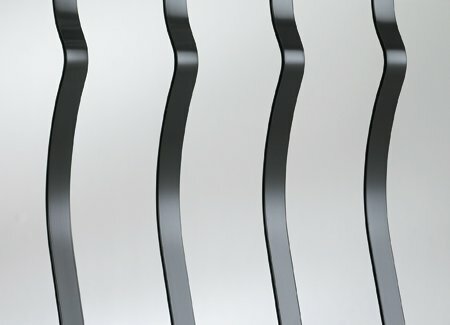 The balusters are aluminum with a textured black powder coating that is commercial grade and will last throughout the years. 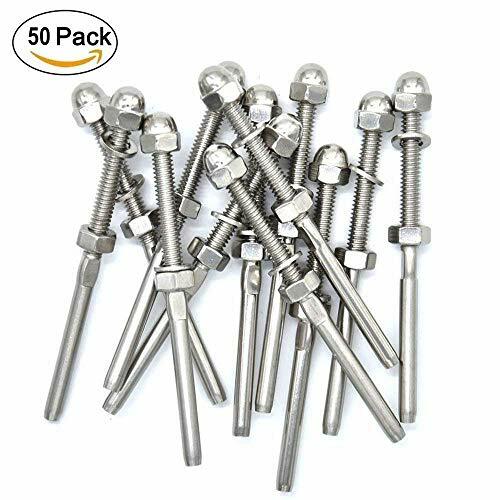 10 pack of balusters with a 20 pack of straight connectors, screws included. ISL-401 Quantity: 12 Pack Features: -Panel. -Rapidly regenerating, renewable and earth-friendly resource. -Made from trees that are native to Mexico and can be used in a plethora of ways. -To secure your panels to the desired surface, simply use wide crown staples; no additional tools are required. 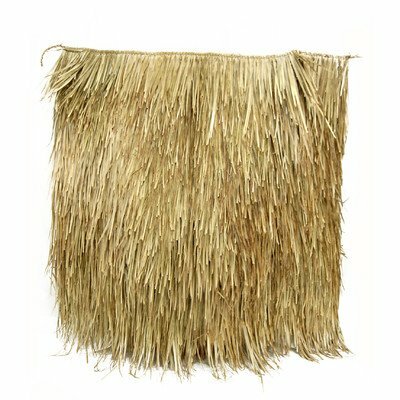 -Mexican Thatch Panels are ideal for use with Tiki huts, Tiki bars, gazebos, umbrellas, awnings, roofing, ceilings and as wall coverings. -On average, you can expect your Mexican Thatch Paneling to last from 3-5 years. -Generally expect a shorter lifespan if using your paneling in humid climates. -Traditional Mexican thatch construction. -Available individually or in a 12 pack bundle. -Overall dimensions: 48'' H x 48'' W.
1. It is recommended periodic cleaning of the form from the concrete. 2. Not recommended for transportation of filled moulds in the process of hardening of concrete. It can be used for casting concrete and plaster. The front surface of the plastic shape simulates wood. Intended for the manufacture of heavy-duty colored concrete by vibratory casting method. When filling out the form does not require any additional equipment. We advise using high quality cement. Why do you need it?  Size Length: approx. 100mm Thread diameter: approx. 1/4" Fit for cable: 1/8"
 We strictly control the safety of products.  Your satisfaction is our top priority, If you have any problems during the transaction or use, please contact us and we will work with you to solve the problem If you need more products.  50 x Threaded Terminal, Washer, Hex Nut and Cap Nut. COMPATIBILITY CABLE- My Hand Swage Stud for 1/8 cable; Hand swage, require hand crimp Swage tool. 100% SATISFACTION GUARANTEE - Your satisfaction is our top priority, if you have any problems during the transaction or use, please contact us and we will work with you to solve the problem If you need more products. 藍Designed for use with 1/8" (3.2mm) 1/19 strand stainless cable. 藍Comes with 316L nut, washer, and finish acorn nut. 藍Hand swage, require hand crimp Swage tool. 藍Stainless is suitable for outdoor or indoor and has an excellent shine and radiance to it. 藍Can be installed at any angle,perfect for cable railing along stairs or odd-shaped perimeters. 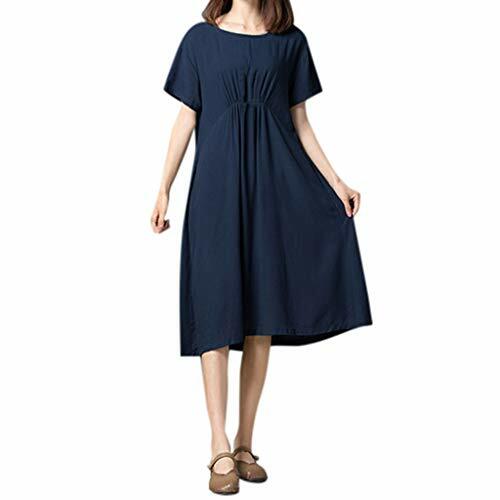 Sengei is focused on creating affordable, high-quality, and long-lasting everyday clothing you can rely on. 1*Please must choose correct size according that dress for you.